LIVE from Sorgatron Media Studio in Pittsburgh, PA! Mad Mike and Sorg talk about Lucha Underground with Co Executive Producer Chris DeJoseph! We ask the tough questions about Dario Cueto’s relationships and current health, what got left on the cutting room floor of Season 3, how some characters evolved during dark matches (You won’t believe what Martin the Moth almost became, and speculate at Season 4! The Midweek War crew assembles to discuss the brackets for the Lucha Underground Cueto Cup! Bracketology at its finest! Last week, Lucha Underground co-executive producer Chris DeJoseph joined the Wrestling Mayhem Show crew for a special edition of the Mid-Week War. During our talk, Chris gave us a big clue into one of Lucha Underground’s biggest mysteries – the seven Aztec tribes. 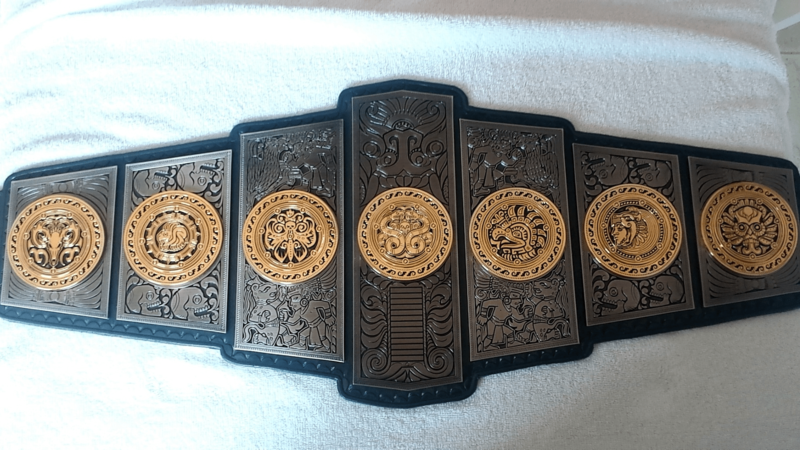 This is the Gift of the Gods championship, and you can quickly begin to make some assumptions based on the seven medallions. We poured over hours of Lucha Underground episodes over the past few days, searching for these symbols (no doubt overlooking many other clues hidden in plain sight). What we discovered in that short amount of time stunnedus.